I was recently on a road trip in Kashmir and visited Gulmarg for 2 days. 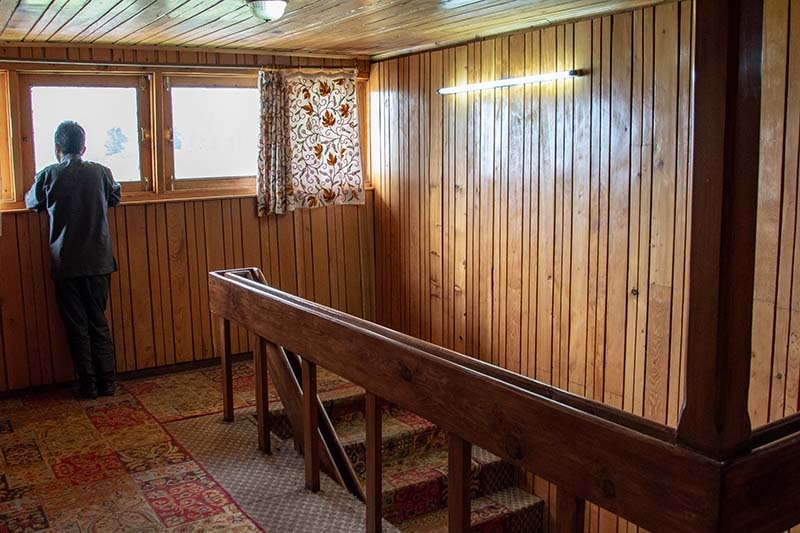 In Gulmarg, I stayed at Hotel Affarwat and this is a short summary of how I found this hotel to be; how their services were and whether or not I will recommend it to anyone. I do not intend to get into a lengthy time consuming review so will just mention the good and bad things about the hotel along with a few pictures. I ended up at this hotel quite by accident. 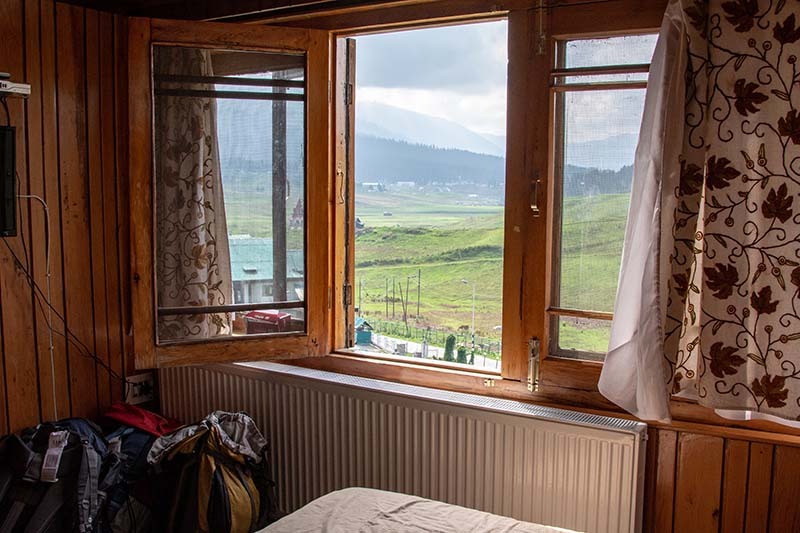 A day before the trip, I was looking for some budget hotels in Gulmarg and the name of Hotel Pine View came up. I called the owner of Pine View and it turned out that it was located at Tangmarg, 14 kilometers away from Gulmarg. When I asked him if he can suggest me a good hotel in Gulmarg, he mentioned Hotel Affarwat. Not only mentioned but he actually even called them on my behalf and confirmed booking. 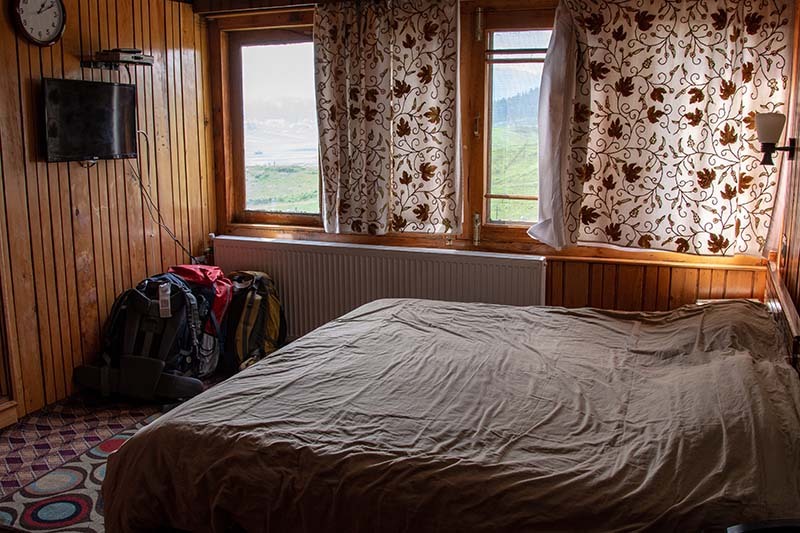 And that is how I ended up staying at Affarwat for 2 days of my stay in Gulmarg. This is one of the good things I liked about the hotel. It is at a prime location and the view from hotel rooms is just great. Tourist places like Golf Course, Maharani Temple, St. Mary’s Church, Maharaja Palace are just a small walk away. There are several others hotels in the same row which also is a good thing because in case you did not get a booking here; or did not like the room then there are others hotels right next to it where you can and check. Rooms were all very comfortable and very cozy actually. There is very nice wooden work all over the hotels including the rooms which gives it a very classy look. There is an Almirah inside if you want to keep your stuff in. If you were visiting here in winter, then there is a huge heater as well in the room. Bed was large enough for 2 people and very comfortable. If you were more than 2 people, then you can ask them to put an additional mattress in the room. The only negative here would be that I felt the rooms could have been a little bigger. I am not saying they were uncomfortably small. Size of the room was decent enough but a little bigger could be a bit better. Washrooms too were of decent size and clean. Hot running water was available. Toilet seats were English style. Staff was very courteous and soft spoken. All our needs were immediately attended to and with much courtesy. Now this could be both a negative or positive depending on the person. The hotel is strictly vegetarian only which kind of worked as a negative for me. Surprisingly though, majority of the hotels in Gulmarg are vegetarian only. I and my friends were hoping for some delicious Kashmiri non-vegetarian so we decided to eat outside. There is a restaurant called Malik Hotel at main Gulmarg chowk where we had our food for 2 days and he served good non-veg. At Hotel Affarwat though, we only ordered a few cups of tea and that I can tell you was good. If you are a strict vegetarian, then staying at Affarwat will work as a positive for you. They rented us a room for 3 for Rs. 2000 per day. With an additional mattress, this fare went up to Rs. 2,500 but that I believe is standard everywhere. 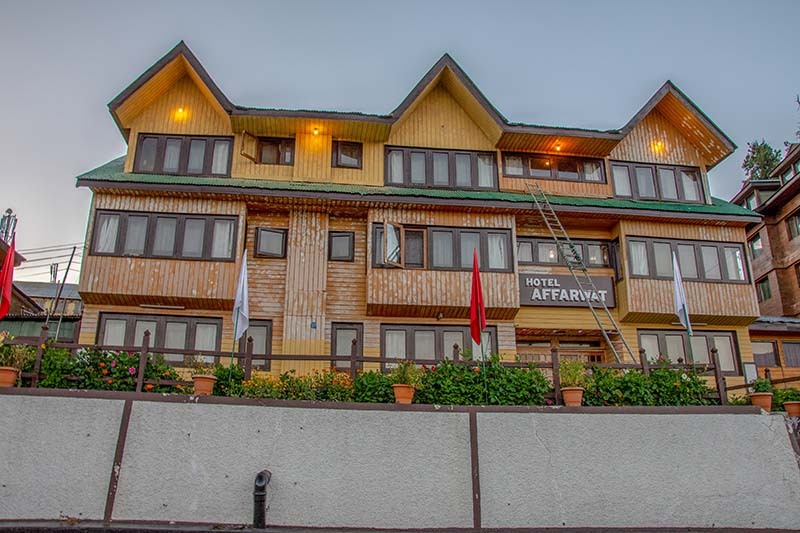 Gulmarg overall is an expensive place and there is no hotel here under this price. This is the lowest you can get and during peak tourist season, these charges will go up a bit. Below are a few pictures of in and out of the hotel. My final word was that Hotel Affarwat is a great place to stay. Even if you wanted to get some non-veg, I will still recommend staying here and eating out at a local dhaba because the food in hotel will be expensive; and I am certain that the non-veg at small restaurants will taste better. Overall, it was a very comfortable, cozy and hygienic place. I hope the information above was of help. If you have any further questions, please feel free to ask in the comments section below; or at our Community Forum; and I will be glad to answer.